How about this beautiful bowl of golden goodness for dinner? Meet super supper mung dal soup! This basic dal warrants being called super, because it's super tasty and super easy to make, as well as super easy to digest. It hits all the marks in Ayurveda! This dish is a favourite for when we’re craving something nourishing and satisfying. Bonus: it doesn't take hours to make and creates minimal washing up. 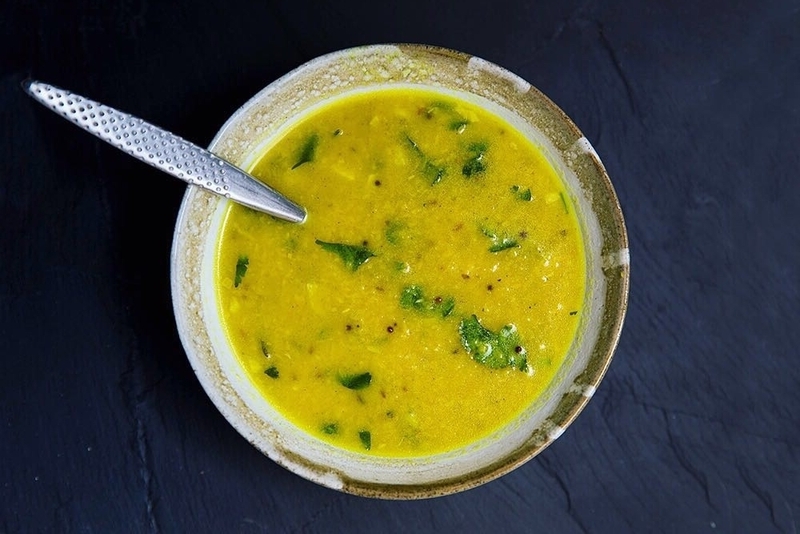 Mung dal soup is especially great for balancing Vata and Pitta — for Kapha types, serve extra soupy with plenty of fresh greens mixed in. If you can’t get the split mung dal, i.e. the little yellow dal, then grab a bag of whole green mung beans from the supermarket and soak overnight, before rinsing and draining. Add the mung dal and water to a large pot and bring to a boil. Cook on medium heat for 45 minutes until soft (yellow split lentils take less time than whole mung), uncovered, stirring occasionally to prevent sticking. Meanwhile, make the tarka: heat the ghee or oil in a small saucepan on medium heat. Add the cumin seeds, mustard seeds and asafoetida, then stir until the seeds pop. Turn down the heat, add the garlic and sauté lightly, then add the curry leaves, coriander, turmeric and masala powder. Stir well and add the tarka to the dal soup. Season to taste, simmer for 2 minutes and serve.